A Unique Blend of Manuka which has a pleasant aroma, formulated as a serum for larger skin area healing applications. Contains 22% pure undiluted Manuka Essential Oil to retain strong anti-bacterial and anti-fungal properties, 1% Lemon Myrtle Oil, 1% Lavender Oil, 1% Tea Tree Oil & 75% Cosmetic Grade Sweet Almond Oil. Bottled and sealed in New Zealand by our Pharmaceutical Lab, we can guarantee it’s purity. Manuka essential oil has been called ” Natures Miracle in a Bottle ” due to its unique medicinal properties. 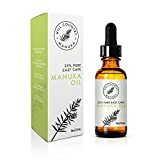 Unlike Tea Tree Oil, Manuka Oil is usually non-irritant on sensitive skin and is very much stronger in anti-bacterial and anti-fungal properties, particularly from the East Cape of New Zealand where this oil is sourced. It is a 100% natural botanical product, used by the native people of New Zealand for centuries. Anti-Bacterial: A natural antiseptic, this healing oil serum is used for acne, on cuts, grazes and wounds for faster healing. Anti-Fungal: A wide variety of persistent skin conditions are fungal infections. Ringworm, Athletes Foot, Tinea, Ingrown Nails & Nail Fungus, Jock Itch, rashes -even persistent diaper rash can be helped with this product without the medicinal smell of the 100% pure oil. Anti-Inflammatory & Aromatherapy Applications: Use for large skin areas of insect bites, Poison Ivy, etc. Some Psoriasis suffers have also reported reduced symptoms with its use. Is also used with massage oil by aromatherapists and masseurs on tired, aching joints and arthritic hands. For a more detailed list of Aromatherapy benefits please visit our website listed on the bottle. We also have a pre-mixed Manuka Massage Oil for sale on Amazon which is ideal for Massage therapy. Add to beauty creams, soaps, etc. etc.